First Man, a workmanlike bio-pic of astronaut Neil Armstrong, is at times compelling and at times maddening. Although inferior in its depiction of the early days of the space program to such riveting productions as The Right Stuff, Apollo 13, and From the Earth to the Moon (the 10-part 1998 mini-series that one might consider to be definitive), First Man offers an intimate portrayal of Armstrong, offering a peek behind the taciturn mask he wore as an icon and hero. Unfortunately, along with his determination to burrow into the lead character’s psyche, Oscar-winning Damien Chazelle (whose statuette came for La La Land) fully embraces the shaky-cam handheld approach. Motion sickness warning! Those who are sensitive to this sort of thing may want to avoid First Man on the big screen. (I have noticed that the shaky-cam technique loses its stomach-churning potency on a TV.) That may seem like bizarre advice for a movie that was in part filmed using IMAX 70mm cameras, but it’s not those scenes that are the problem. And, while it’s defensible to argue the stylistic merits of shaky-cam for the cramped, chaotic environment within the early Gemini and Apollo craft, Chazelle uses the approach for a variety of land-based family and work environment shots. Although the intention of employing the wobbly hand-held shots is to create a deeper sense of immersion, I found the opposite to be true. It is an almost immediate distraction and makes the viewer keenly aware of cinematography and technique. Every time the camera shakes, I was aware that this was a movie. 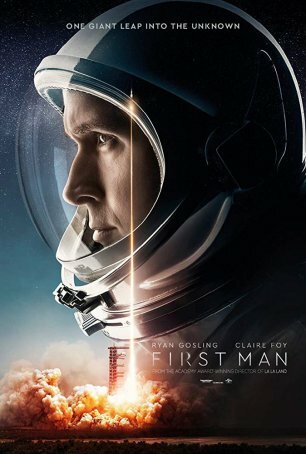 (I am not subject to motion sickness in theaters but I could sympathize with how those who are might react to some of the scenes in First Man. In a post-screening discussion among colleagues, this was the first issue that came up.) It’s not a “little thing” – it’s a legitimate impediment to appreciating an otherwise involving drama. A “controversy” has developed about how Chazelle handles a particular aspect of the moon sequences. He does not show Armstrong and co-astronaut Buzz Aldrin (Corey Stoll) setting up the U.S. flag. Taken out of context, this might seem to be an egregious, unpatriotic omission. In context, however, nothing could be further from the truth. The moon scenes aren’t about recreating history; they are about providing a window into Armstrong’s thinking. As such, most of what the astronauts did on the moon isn’t in the film. And the flag itself isn’t removed – only its planting. There are two shots of the lunar lander with the flag very visible next to it. The flag is a visible touchstone throughout the film and a deep sense of patriotism is evident in the subtext. Toward the end, a French woman expresses appreciation for American ingenuity and perseverance. One of the final scenes is a re-affirmation of Kennedy’s determination that America put a man on the moon (and return him home safely) by the end of the (1960s) decade. Those who would level charges against Chazelle should see the movie before jumping to conclusions. Armstrong was an engineer, a pioneer, a father and husband, and an American. The movie depicts all of these things. As Armstrong, Ryan Gosling (who previously worked with Chazelle on La La Land) provides Armstrong with an expectedly inscrutable façade. His moments of grief, self-doubt, and self-recrimination are all private. Gosling’s performance honors both the man and the icon. (His delivery of Armstrong’s moon-landing statement, although subtly manipulated by computer, is so perfect that many will think Chazelle appropriated the actual recording.) Making the most of a supporting character, Claire Foy’s interpretation of Armstrong’s firebrand wife, Janet, appears to be headed directly for a Best Supporting Actress nomination. Despite being about spacefaring, this is not a special effects-loaded production. There’s some visual razzle-dazzle, to be sure – shots of the spacecraft, of Earth from space, and of the actual landing – but those instances are limited to what’s necessary to tell the story and, as a result, are effective without seeming overwhelming or gratuitous. Justin Hurwitz’s score is effective in doing justice to the moments of grandeur and the quieter, more personal ones. His style varies between Hans Zimmer for the former and Rachel Portman for the latter. Timing is undoubtedly one of First Man’s assets with Apollo 50 (the half-century anniversary of the moon landing) coming next year. Interest is high and Chazelle’s presentation of events and the central player in them will heighten it. (The movie will be released on home video only a few short months before the actual anniversary.) For those who can get past the shaky-cam aspect that infects the cinematography, this is an involving look back in time at one of the most significant human endeavors of the last century. It’s not definitive but it is welcome.